Meet the new-look nourish! Now in a larger, luxe format with a focus on plant-based culture, health, wellbeing, and nutrition - but no less delicious way of living. 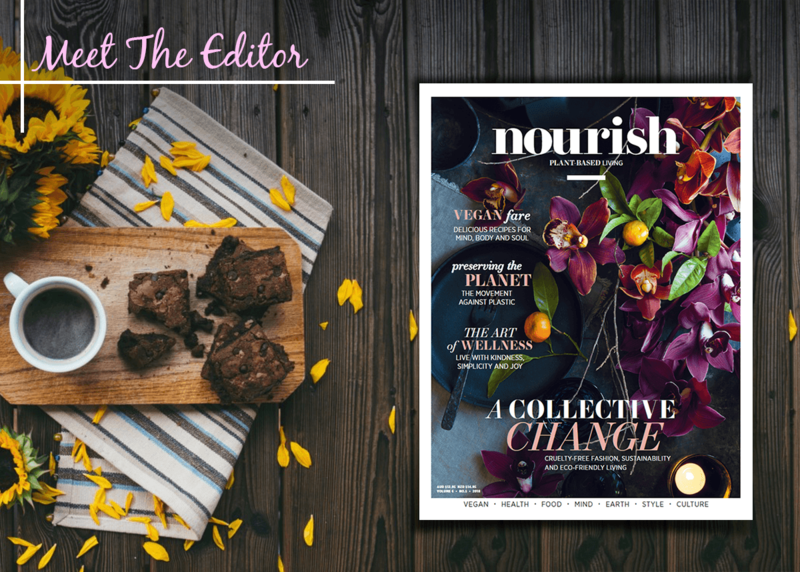 We speak to editor Danae Dimitropoulou to find out more about what the new-look nourish will cover from health and wellbeing to mindfulness, cruelty-free fashion, and beauty! Can you describe nourish magazine? Who is it for and what is its mission? The new look nourish is a luxury wellness magazine with a plant-based, sustainable focus. The new look nourish takes holistic health into consideration; this extends to our physical, spiritual and environmental health, and it centres around living a kinder, more connected life. Our mission is to educate our readers about how vibrant, enticing and satisfying a plant-based lifestyle is. Through our inclusive language and balanced editorial approach, we’re hoping to encourage people from all walks of life – omnivores, pescatarians and vegetarians alike – to eat more plants and tread more lightly. What does the new nourish look and feel like? The new nourish comes in a larger, more luxe format with a contemporary feel. Our designers are incredibly talented and they’ve curated a clean, unique look. Every font and image has been hand-selected. Our re-design is reflective of our progressive approach to editorial, which is modern and carefully considered. Most importantly, we believe in creating magazines that are filled with quality content and that aren’t jam-packed with lots of ads and advertorials. What do you think readers will love most about the new-look and feel of the magazine? I believe that readers will love the quality of our content, the amount of wholesome, plant-based recipes on offer and, of course, the beautiful visuals. Since the magazine went on sale, we’ve had an overwhelming amount of support. The plant-based community have been thrilled that a mainstream health and lifestyle magazine is passionately advocating for their cause, while other readers have been excited about more content, less ads and the new approach to editorial. That’s an incredibly tough question for an editor to answer! Truthfully, I can’t pick just one. From features on the art of wellbeing, the science of mindfulness, the future of sustainable fashion and even organic beauty, there’s so much goodness in this issue. What can readers expect from future issues of nourish? More quality content, inspired recipe ideas and the latest in plant-based culture. We’ll be showcasing how delicious vegan food can be, while expanding the conversation on health, wellbeing, mindfulness, fashion, beauty, travel and more. If nourish had a motto what would it be?